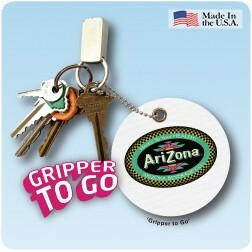 Great for key rings or for backpacks! Hang it over water bottles! Helps open water bottles, screw-top wine caps, nail polish bottles, twist-off beverage caps, pill bottles and more. Get a grip on your marketplace. Available in 14 colors. Now available with 4-Color Process Imprint. Includes eyelet and chain. Some assembly required.